This cruise-in returns after a two year hiatus! Information below is from previous years, but it will be the same according to Jeff. $10 registration fee. 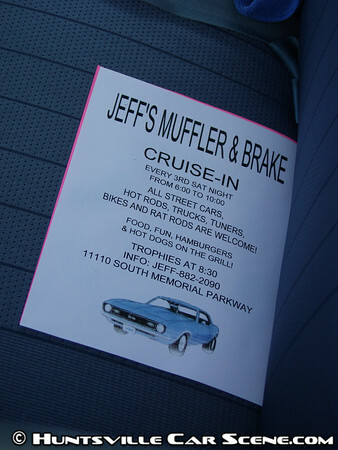 All street cars, hot rods, trucks, tuners, bikes, and rat rods are welcome. Food, fun, hambugers and hot dogs on the grill. There is also a 50/50 as well as awards at 8:30pm. Talked to Jeff this morning and tonights show has been cancelled. Thank you. I'll update the calendar listing. Anyone else going tomorrow night the 17th? The weather is going to probably keep me inside Saturday. haha...I would but I've been working the last week on a site change that I can probably roll out tomorrow if I work on it. I just talked to Jeff and he is not having the show tonight. He also told me no more shows this year. Just wanted to let everyone know. Thank you! I'll update this listing for next year. Weather plays the biggest factor in any of the regular events. If we still had 70s this weekend, it would have been a perfect day for all the events. Oh well, tomorrow's going to be sunny and I'll be out with my cameras at the ATO show. Is this still going on rhis year? It should be. I haven't heard anything to the contrary. I'll see if I can't give Jeff a call and update the listing here if need be. I just called Jeff and he said Saturday night is the first show and the schedule is the same as last year. Thank you cruel1hemi! I've been behind all day, and now I have one less thing to try to do. so this saturday the 20th from 6-9? Maybe, if I get my brakes done.